Snippets are the lines of black text that appear in every search result listing. They portray the page’s relevance by making the words ( whatever the user type in the search query ) bold as shown below. In the below case the user searched for the term “SEO”. Now, what does rich snippet add to the normal snippet? 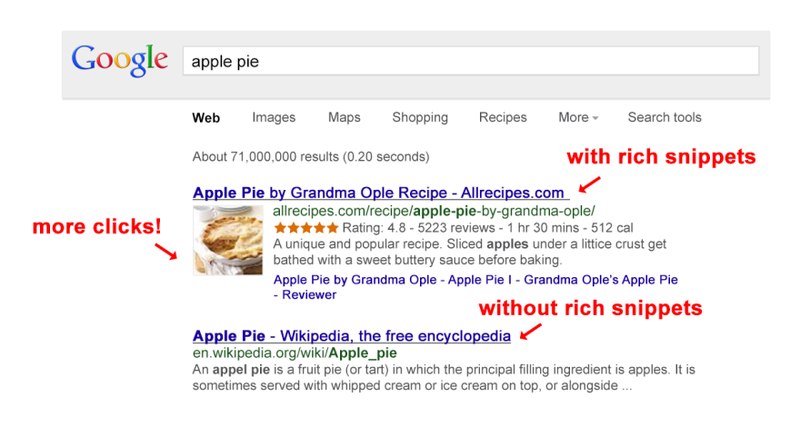 Rich snippets are extra pieces of information that the search engine is able to recognize on the page. It is used to enhance the searcher’s understanding of the page. Ratings, pricing, and availability are commonly seen in Snippets. Let’s see an example of rich snippets in the search results below. In the above image, you can see that by using rich snippets- rating, reviews, the time taken for preparation and the calorie count are clearly visible. Therefore, it attracts more clicks. Note how the three components have been utilized. We provide Digital marketing services. To know more about our services, visit our website.